Spring may be having a slight problem progressing to its natural state of warming temperatures but that isn’t stopping the season’s most exciting early season series from moving into its second of six episodes. Yonkers Raceway’s the George Morton Levy Memorial Pacing Series and the Blue Chip Matchmaker is once again featured this weekend. The ‘Levy’ and Matchmaker march through the last weekend in March on Saturday and Friday, respectively. At the Meadowlands on Friday and Saturday, the Horse & Groom trotters and the Clyde Hirt pacers finish their series with a final each. Horses to watch (H2W) also parade in their specific order below, as presented exclusively for TwinSpires harness blog readers. Live probable across-the-board and exotic contenders are delivered neatly in the scheme. Yonkers Raceway’s Saturday night program focuses on round two of six Levys for the older male pacers. The second leg attracted 29 contestants, a contrast to the 36 entered in the opening leg. The first division features only one pacer returning from victory in the opening preliminary, Bettor’s Edge. Both he and the PJ Fraley entry of Validus Deo and Fat Mans Alley, whom will occupy the rail on the gate, will be the attractive forces in the public’s eyes. It’s clear who carries value with them this week. That horse would be Word Power, who went a conservative mile in the opening leg by never leaving the comfort of the pylons. It was sketchy from the get-go on whether or not Word Power would race aggressively, due to it being his first pari-mutual outing in three months. Now that he has a mile under his belt, it is more likely they will try to put Word Power into a stalking spot to try and sweep by horses late. He returns as our outside contender again this week. A Ron Burke trio, coincidently putting their noses on the inner three posts of the gate, headlines the second Levy division. That trio includes Escape The News, Itrustyou (a prelim winner) and Special Forces. Since Escape The News and Special Forces both finished last in the opening-round divisions, they’ll be coasting on Itrustyou’s gate-to-wire performance against Yonkers star A J Corbelli. Since Itrustyou may not be any value in the win pool, we’ll take a shot with two improving horses coming from the center of the starter. The better of the two is Flem N Em N. He has spent his winter at Yonkers, racing against the median of the class ladder. While he did ship across the river a few times to race against B-class horses at the Meadowlands, he shows a special talent for the half-mile oval. He displayed that talent last week, being the first to challenge Itrustyou for command, gaining 5 lengths to do so. Even then he didn’t quit, only losing 2 lengths through the stretch. There is a great possibility he can improve off that effort, and the price will be good too, given bettors will discriminate due to the outside post. The second horse we’ll use will be one that would provide extremely generous payoffs in the exotics—Keystone Velocity. He made his first racetrack appearance in four months last week due to being plagued with injury and illness scratches. 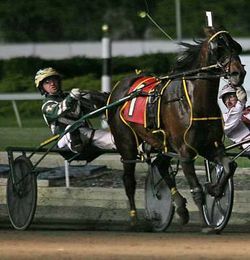 The consecutive scratches put him on layoff until March 14 when he qualified well at Yonkers. Come race day eight days later he gave chase behind Itrustyou as he coasted on the lead. Looking at the form he showed in 2013, he was sharp and could press the pace well. There is a great possibility he can return to that form this week, the difference being that he might travel an easier mile rather than going first over. The third division is among one of the speedier, due to A J Corbelli, Sweet Lou and Easy Again. In scenarios such as this, the route to take would be for a stalking horse that may be overlooked. A majority of this category of pacers resides on the outside in nine out of 10 races at Yonkers. To add on to the puzzle of this race, Apprentice Hanover drew the rail. The Ben Wallace trainee will be the likely favorite for his arduous task of racing against fan-favorite Foiled Again. With all that being said, there is one horse that fits into the categories of value and will be stalking the leaders: Dancin Yankee. The only way this horse knows how to race is from off the pace, exemplified in the Opens at Dover. The one time he raced on the lead was at Yonkers from post 7, where he still managed to get second. He may be in the right place at the right time but more importantly at the right price. The final Levy episode of the night features Foiled Again. Now 10, he continues to be a fan favorite. Yet, the question to be asked is whether or not there is value anywhere else in this event. There is one horse that carries the possibility of defeating Foiled Again and with that, winning at a price. To Foiled Again’s left flank resides Eddie Sweat, an improving four-year-old pacer. Eddie Sweat is a specialist racing from slightly off the lead but was sent for the front last week, taking no prisoners with a :26.3 first quarter. If he stands any chance of beating Foiled Again he will need a tactical drive that gets him just in front at the wire. The second preliminary of the Matchmaker series commences Friday, featuring 27 mares in four divisions. Division one is the best betting affair of the night, with value on the horizon due to key horses from leg one drawing outwards. Such horses include Bettor B Lucky and Swinging Beauty, Burke trainees who traveled first-over journeys in their divisions. Another horse coming in off a notable mile is Krispy Apple. Drawing into the same division as the valiant Somwherovrarainbow, she tactically got away towards the middle of the pack and rode her cover while she dueled with Royal Cee Cee N for command. Because of this battle, Krispy Apple abused the tough work of Somwherovrarainbow and came a nose from a winners’ circle photograph. This week, while she did have all the work paved for her last week, she’ll benefit from drawing into the “weaker” division. Let’s Go Higher is a key horse in which to use in the exotics. Last week, she sat third at the pylons while Yagonnakissmeornot drew away from Economy Terror in second. Let’s Go Higher managed to sweep up late at 17-1 to complete the exacta. She draws post 2 this week, making a similar trip very possible. Charisma Hanover and Anndrovette are the ones to beat in division three. Anndrovette had no room to pace until late in the stretch, resulting in a fourth-place finish in her 2014 debut. Charisma Hanover was in the same boat, except she didn’t have as fierce a drive as Anndrovette. If you are willing to bet against these two monsters, Uf Dragon’s Queen is the horse to take. Her last start can be dismissed, as it was her first start back off a layoff. Shown by her lines as a three-year-old, it’s clear she has talent. It’s possible she could win in her second start and she draws into the smallest field, with six noses lining up on the gate. The final division has a Burke duo dominating the wagering yet again, this time it’s the entry of Rocklamation and Camille. The two went off as the 1-5 favoriteentry last week, losing to Angels Delight at 7-1. In that same mile came Shelliscape, famous for her sweep by Anndrovette in the Breeders Crown Final on a muggy October night last year. She made her first start of 2014 last week, deserving leniency in significance of the mile. While she draws post 7 this week, her talent in come-from-behind efforts is obvious, and that might be the route to take this week. Saturday’s Horse & Groom and Clyde Hirt finals highlight the Meadowlands program. The “Hirt” is first with a field of 10 and last week’s bust, Wake Up Peter, drawing the outside post. Even with the 10 hole and the misstep last week, “Peter” should get a lot of play but chances are the pacer leaving to his left, Burkentine Hanover, will be dismissed. We hope that is the situation, since inside of them are a few Hirt winners that will seduce the crowd into thinking this is more of a contest than it may actually be. “Burkentine,” our choice last week, was dynamic from post 10 at 12-1. He could be in that area for betting here, too, making him more than worth the backing. Then the Horse & Groom Final finds its probable favorite in a similar position as Peter, leaving from the farthest post. Banker Volo was a winner for us last week but we had no idea when we called him that the fans would bury his part of the pool with bets. A better proposition in the final is an outside contender, Hldontghttoyurdrms. The first plus for us is driver Jonathan Drury, who will repel the crowd since he is not one of the popular names harness bettors adore. Next, the classy Woodbine shipper has had two strong journeys in series legs and is bound to bring value to the pools and promise profit worth more than his chances.